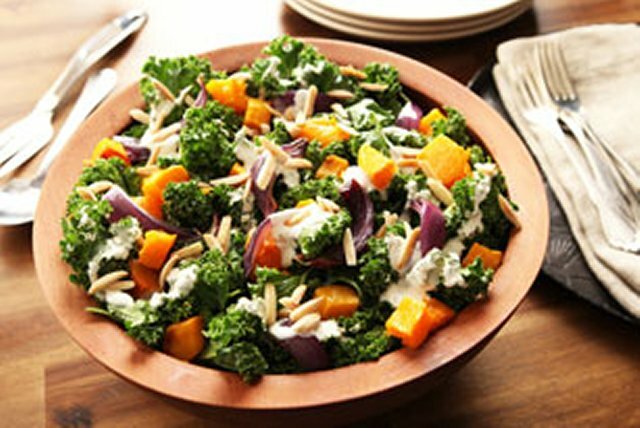 Fall vegetables are roasted to intensify their flavours and then mixed with fresh kale and slivered almonds for a salad that looks as good as it tastes. Place squash and onions in large bowl. Add oil; toss to evenly coat. Spread onto rimmed baking sheet. Bake 40 to 45 min. or until squash is tender and golden brown, stirring occasionally. Spoon cooked vegetables into large bowl. Add kale; mix lightly. Drizzle with dressing; top with nuts. Sprinkle with Kraft 100% Parmesan Grated Cheese just before serving.